Are you satisfied with your product profitability? They demand a solution that is easy to use, works directly with their CAD data, and helps them increase the coverage of what they can analyze before the transition to manufacturing. Are your designs optimized to use the least expensive manufacturing processes possible while still achieving your product requirements at the levels of quality demanded by your customers? If you’re not using a 3D tolerance analysis solution today, you’re probably spending more making your products than you need to. 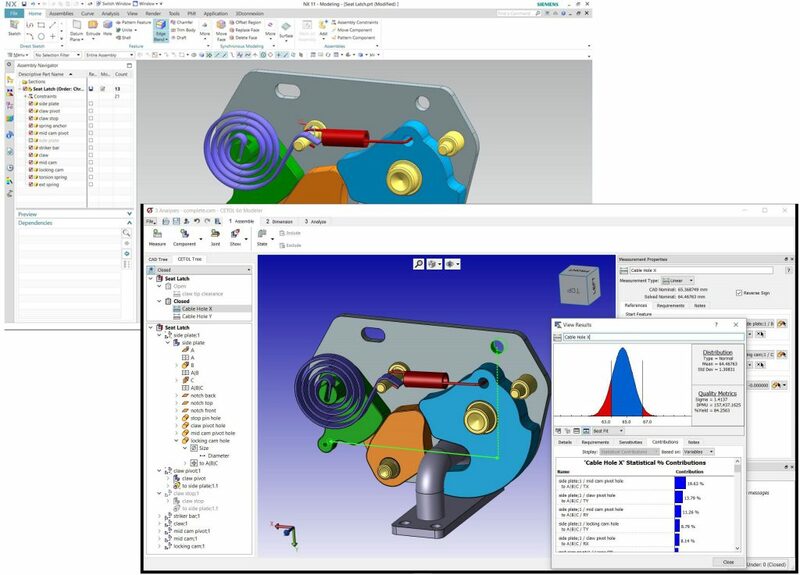 CETOL 6σ for NX enables product development teams to easily and fully understand the often complex impact of dimensional and assembly variation on their designs. This knowledge enables them to make adjustments before problems appear in manufacturing or, even worse, in your customers’ hands. The cost of achieving a quality product grows exponentially as it moves from design to manufacturing and finally to your customers. CETOL 6σ gives engineers the tools to identify and resolve issues earlier in the process, helping to maximize the profitability of your products for your company. Sigmetrix is focused on providing accurate answers to your engineering questions as easily as possible. Our customers continue to tell us that CETOL 6σ is the easiest 3D tolerance analysis solution available. Recent releases have made it even easier by restructuring the interface to align with the modeling workflow, making the most commonly used tools readily accessible at each step, updating the Advisor to provide feedback specific to the tasks being performed at the time, and supplementing this with a powerful help system including over 40 videos that help users understand the methods and tools even better. In short, the latest versions of CETOL combine the power and advanced capabilities demanded by specialists wrapped in an interface and help system to support casual users who don’t perform tolerance analyses as frequently. Works directly with your CAD files – no data conversion required. Avoid rework. Design changes that inevitably occur will automatically be reflected in your tolerance studies – no need to fix, or worse, recreate the analyses. Changes to tolerances or input statistical distributions immediately update the results. Optimize the design quickly without having to rerun time-consuming simulation cycles each time an input parameter changes. Sensitivity plots and visualization tools highlight the impact of each source of variation on the design. Achieve a better understanding about how your design reacts to real-world variation. Identify and resolve potential problem areas before they are found in manufacturing or by your customers. Contribution plots show what dimensions and tolerances are driving the variation in the design objectives. Start with tolerances that are the least expensive to manufacturing and have CETOL guide you on where to invest in more expensive processes needed to achieve specific product requirements. Advisor with 3 classifications of messages provides guidance on the next steps or items that should be reviewed by the user. Gain confidence that nothing has been overlooked in defining the analysis or in defining the dimensional requirements on your part drawings. Where is the best application of Statistical Process Control (SPC)? Can we use this group of non-compliant parts or must we scrap them? Which vendor will provide us the quality we need at the lowest cost? Powerful context-sensitive help system with over 40 videos showing how to perform specific tasks. Start using the software again quickly after not using it for a long time. Comprehensive and customizable reports. Provide just the right amount of information needed for your target audience to understand your efforts, conclusions, and recommendations. Common, open data formats such as XML for storing the CETOL 6s data and CSV and HTML for extracting other data from the analysis results. Integrate the CETOL data, including results and the data generated to obtain them, with other engineering analysis or quality systems. Visual feedback for each item via Interactive highlighting in CAD graphical window when the item is selected. Quickly identify each item of the analysis with visual cues. Analyses definitions can be saved as a template for application to next-generation designs. Leverage what you’ve learned from previous designs while maintaining a dynamic model to help you make adjustments needed for the new design.